Top ice cream or cheesecake with our Regal Chocolate Sauce recipe! 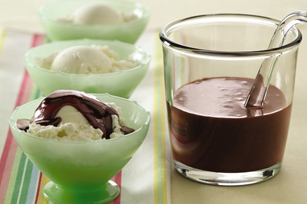 In less than 10 minutes, this chocolate sauce recipe makes a rich, tasty dessert sauce. Microwave chocolate and water in large microwaveable bowl on HIGH 1-1/2 min. Stir until chocolate is completely melted. Add sugar; mix well. Microwave 3 min. or until sugar is dissolved, stirring after 2 min. Stir in butter and vanilla until butter is completely melted and mixture is well blended. Stir in 1 Tbsp. MAXWELL HOUSE Instant Coffee along with the sugar. Serve as a topping for your favorite flavor ice cream or cheesecake.